As exciting news rarely stays quiet for long, you may have already heard there will be a new Pacer chapter in Whittier, CA! The Pacer Nation welcomes our new chapter and we are so excited to watch it grow. As Pacers, we want to serve more communities; keeping the Pacer magic to ourselves would be selfish. We want every community to have what we have. Bobby Romero has agreed to help us do just that by bringing the Pacer secret sauce to his community in Whittier. Many of you know that Bobby and his wife, Dolores, moved to Whittier last year and have been commuting to the Pasadena Pacers. In fact, there are many Pacers who commute from afar to Pasadena. After a year of kicking around the idea, we are ready to extend this amazing running community to Whittier. The Whittier Pacers has the tremendous advantage of having Bobby, one of Pasadena Pacers’ previous Presidents, as Founder. To add to this great team, the Whittier Pacers are getting Monica Bobadilla as their first President. Monica’s volunteerism, kindness, and love is well known to us at the Pasadena Pacers and, while we will miss her, we know she will continue to propel others into the very best version of themselves in Whittier. Some Pasadena Pacers will love the new location; it’s just like getting a new Trader Joe’s around the corner. 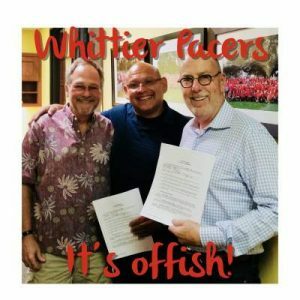 If you are running with the Pasadena Pacers and live closer to Whittier, please check them out. You’ll find the same warm affectionate group of friends with great training programs at all of our clubs. The Whittier Pacers will have its inaugural run on June 2, 2018. You can go to their Facebook page or website for all the details. Please show your support for Bobby, Monica, and the Whittier Pacers by heading out there and going for a run sometime over the summer. (I’ll miss the kick off, but plan to go for a couple of runs soon.) While you’re at it, show your support for San Bernardino and Thousand Oaks by dropping by for one of their runs, too. You’ll find some great runs and some of the most interesting and kind-hearted people anywhere!